This, ladies and gentlemen, is my Mom! I had made several scarves before Christmas thinking I would give them as Christmas presents. But then I had another idea for presents. 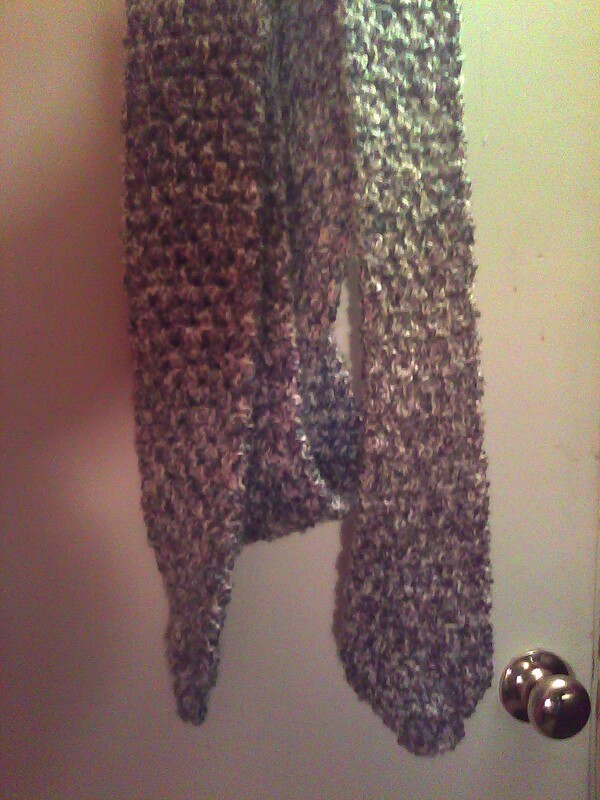 So I “scrapped” the scarf idea and put the ones I had already made aside for the time being. My Mom then recently mentioned that scarves were so “in” this year, and I asked her if she wanted one. So I took the three I had made over to her and let her pick the one she wanted. I have an MP (mass-produced) scarf that has pockets in it and I just love it. I can put my hat and gloves in the pockets when not in use and they don’t get lost! So I decided to make some of my own. The pockets are very easy to do. 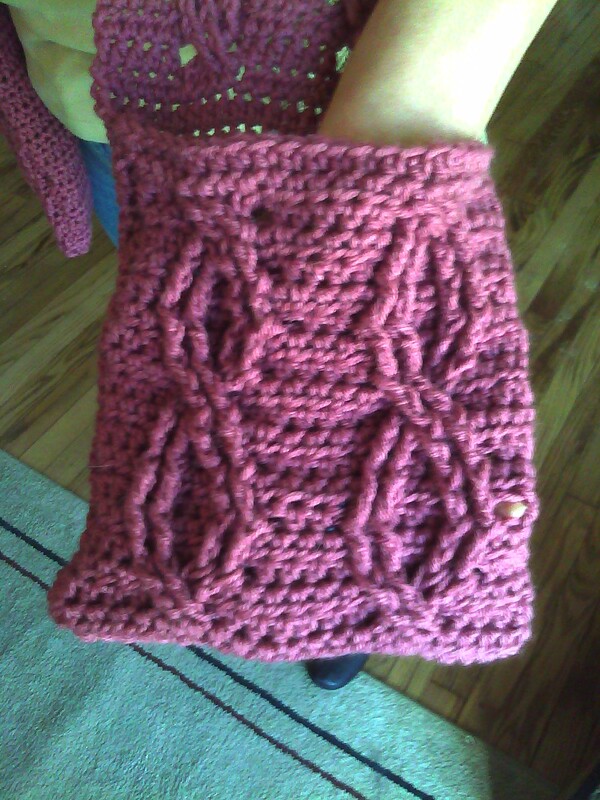 They’re just slip stitch joined with the right-sides facing at both ends and then turned right-side out. I also decided to do cable stitches to make it even more interesting. This is a very simple four-stitch cable where the cables wrap around each other in pairs. If anyone would like the pattern let me know and I’ll be glad to post it. Sorry for the slight blur of the detail pic. I thought I’d gotten a clear shot. Thanks to Mom for agreeing to appear on the site. Hope you enjoy! 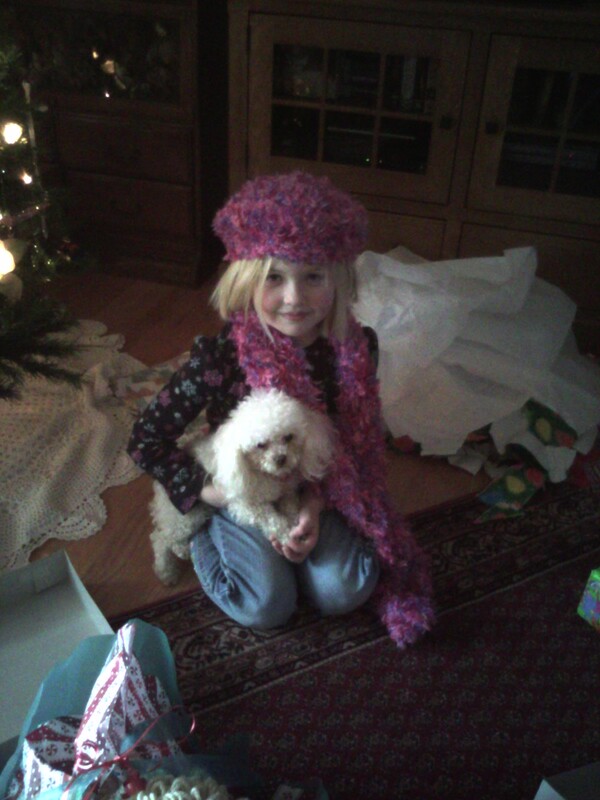 This is my Niece, Kaeli, and the first of the Christmas presents that I will post for this year. I had this yarn that I had started a knitting project with but never finished. I had wanted to learn how to knit and picked up a book and taught myself the basics. But I just don’t enjoy it as much as crocheting so I’ve all but given it up. So instead I decided to use the rest of the yarn for this set. 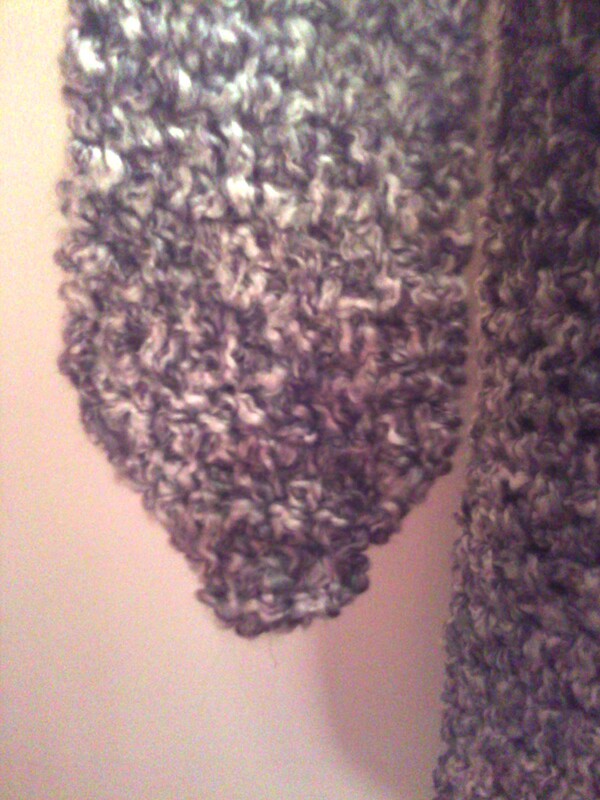 The yarn is bulky and fun. The colors make me think of bubble gum and just seemed perfect for a little girl. It is hard to work with though as you can’t really see your own stitches in the last row or round, and I had to crochet it mostly by feel of where the loops were. 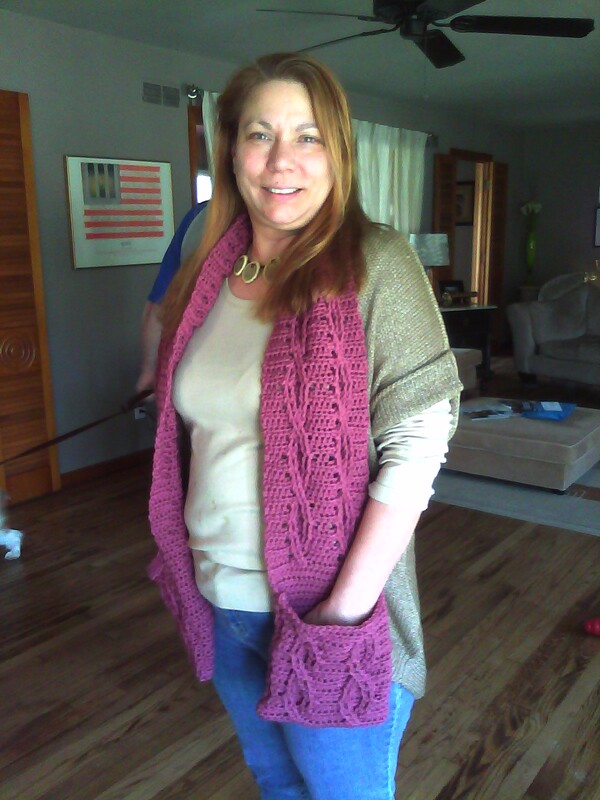 The Scarf was a little easier than the hat as I just used a single crochet and chain one stitch. That way I could single crochet each row in the spaces from the previous row, making it much easier to feel where to insert the hook. I had to modify the pattern for the hat slightly so it wouldn’t be too big for a little girl’s head, and I was so worried that it wouldn’t fit. But it seemed to work nicely. My boss is moving to our office in Rockland, Maine. So I made him this scarf to keep warm. He had mentioned that he used to have this really long scarf that was very thick. He said that he could fold it in half, wrap it around his neck and thread the loose ends though the folded end. So I made him one that he could do just so with. This monster is 58 inches long, folded in half! It is made with a bulky yarn by holding two strands at once to make it extra thick and warm. 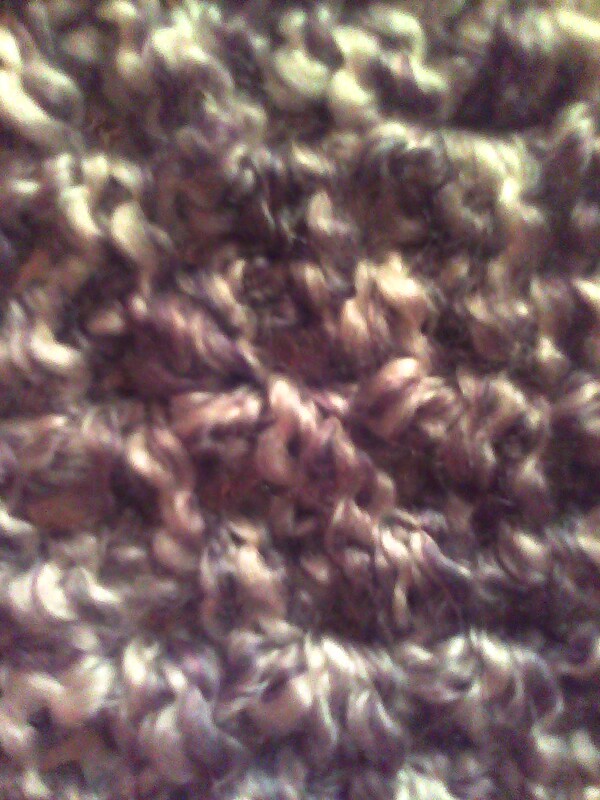 But to keep it flexible, I used single crochet and chain 1 stitches. The ends are made in single crochet stitches with a two stitch increase (at the beginning) or decrease (at the end) for 4 rows. That ought to keep him warm!